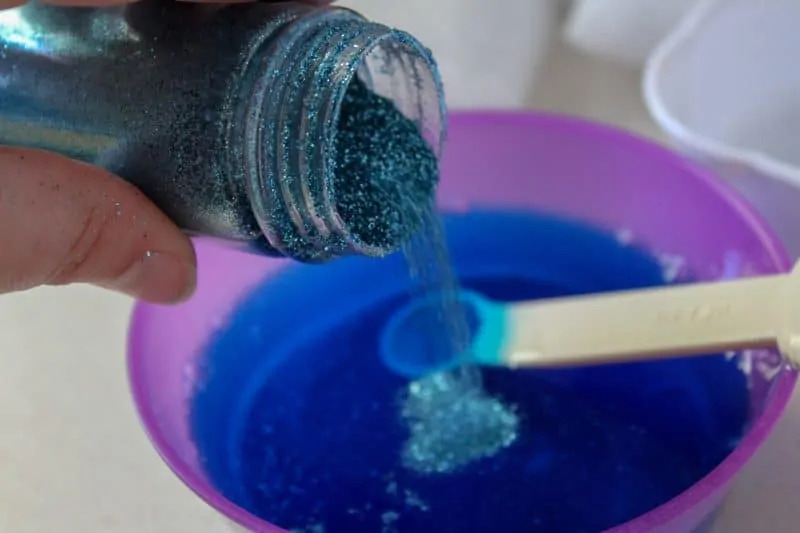 This blue and glittery, borax-free, under the sea ocean slime is a fun DIY sensory activity perfect for the summer months. You know those rainy summer days when all the kids want to do it go outside and play. 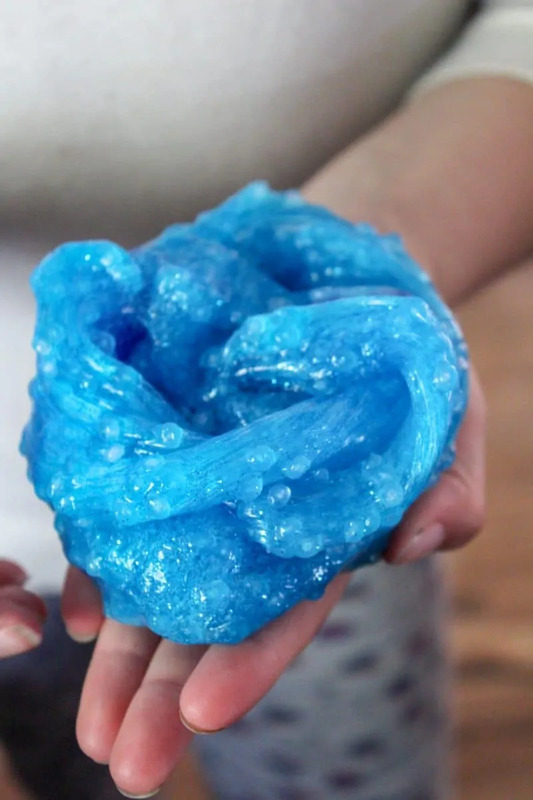 This ocean slime activity is great to keep the children entertained while stuck inside. Or, maybe you are looking for a fish-themed craft or ocean-themed kids activity. 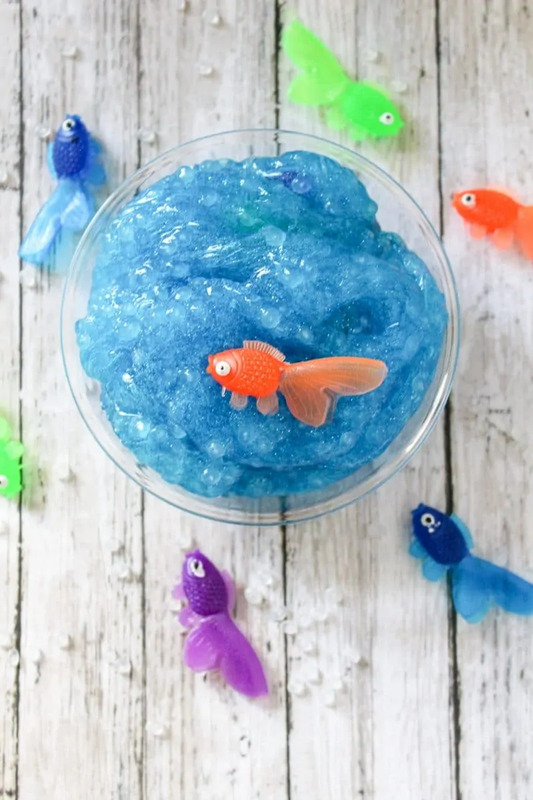 Either way, you will love this DIY ocean slime recipe. 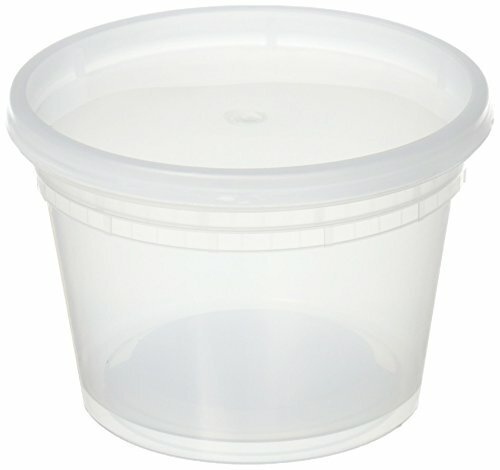 It comes out nice and thick, and holds small plastic fish in it well. Make a batch of these easy Under the Sea Banana Treats for the kids to enjoy along with this activity. 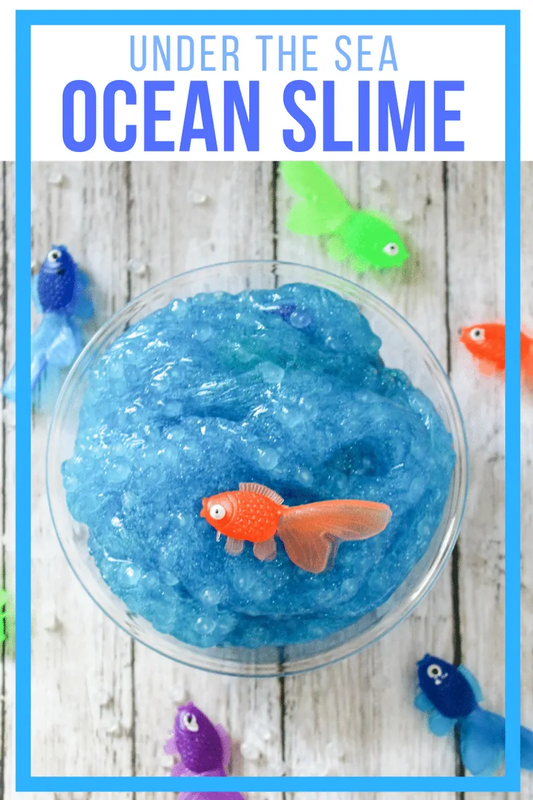 The little ones will have a blast playing with this textured slime, and trying to pull the fishies out. Honestly, the older kids will love it too, since it really is just a ton of fun to play around with! 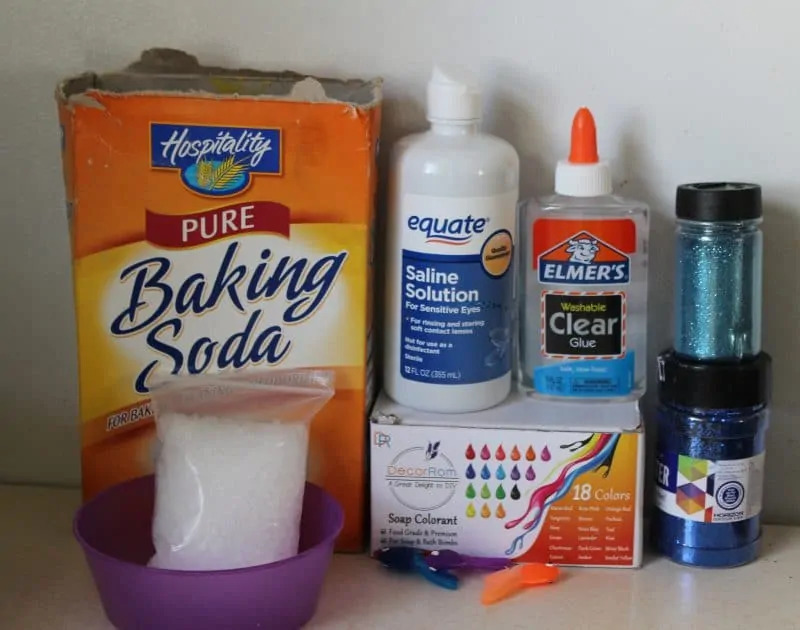 Let's take a look at what you will need to whip up a batch of under the sea ocean slime. You will notice that we used soap colorant to color our ocean slime. 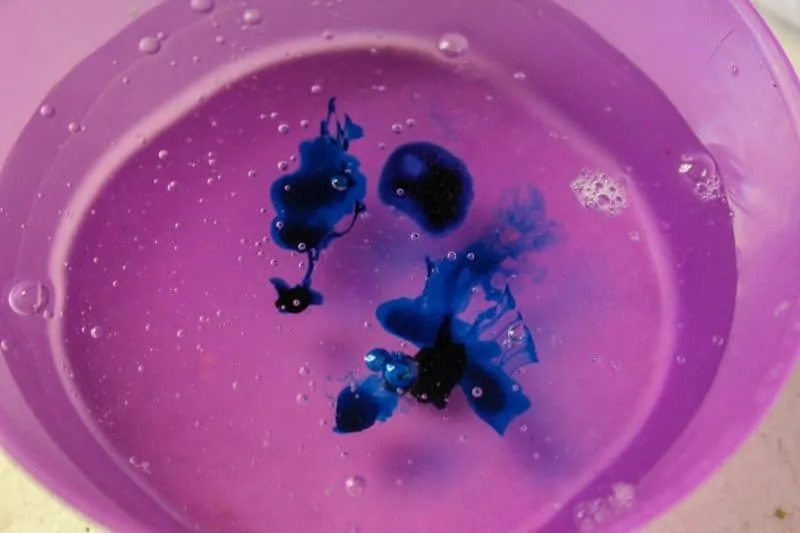 I would recommend you use soap coloring rather than food coloring as well because it doesn't dye your hands like food coloring does sometimes. 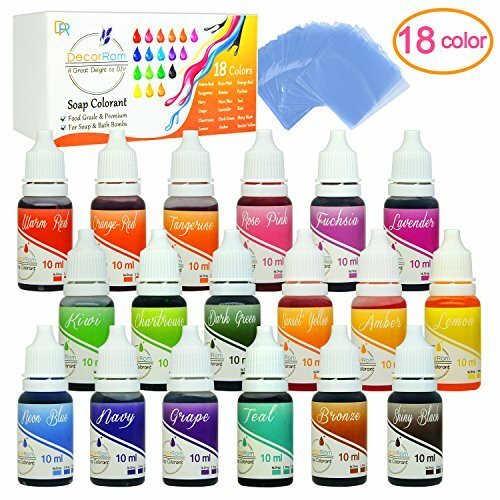 Plus, there are a ton of colors to choose from! 1. 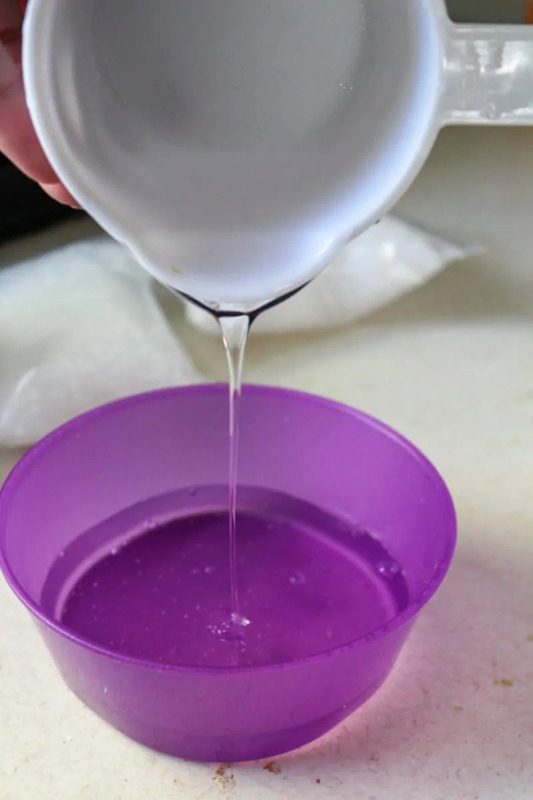 Combine glue and water in a small bowl. 2. Add a few drops of blue coloring (we mixed a bit of navy with neon blue). Stir to mix well and add in additional drops of coloring if desired. 3. 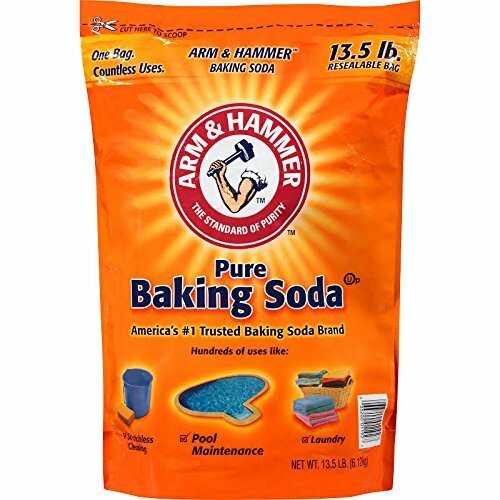 Add baking soda and stir to combine. 4. 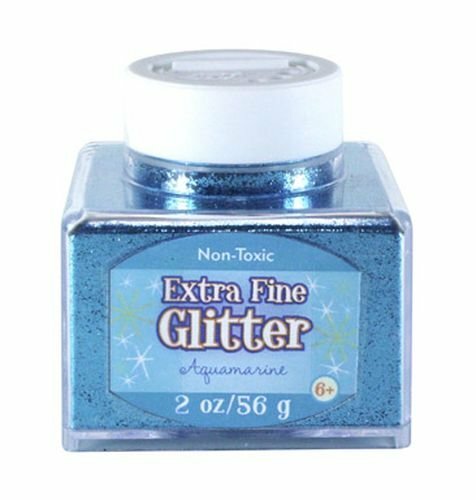 Next, add some glitter. 5. 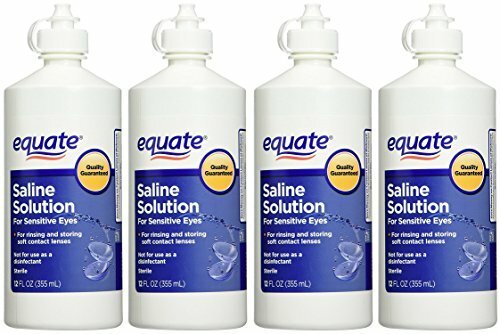 Then, add the saline solution. You will see the slime instantly begin to form. 6. 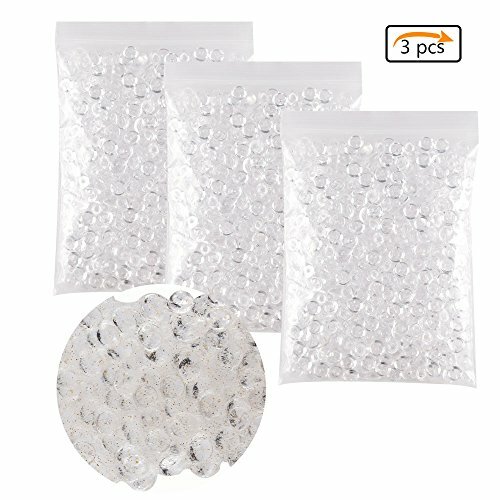 Pour some clear fishbowl beads and slowly add more to make it the consistency that you want. 7. At this point the slime will be very sticky– but don't panic! Just mix the slime in the bowl until it becomes more formed. Once it is a bit more formed knead the slime a bit until it is no longer sticky. 8. 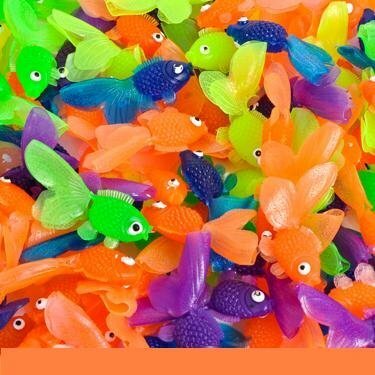 Add a few plastic fish into the slime and then it is ready to be played with! Once you are done playing with your under the sea slime place it into an airtight plastic container for storage until your next play session. My granddaughter would love to make this and it would be fun for her and her friends to play with. It looks like an easy recipe to follow. Looks like a ton of fun to play around with! What a nice project. I love the color of the sea water. Thanks for posting! I love that it’s chunky with the bubbles in it. Very cool! 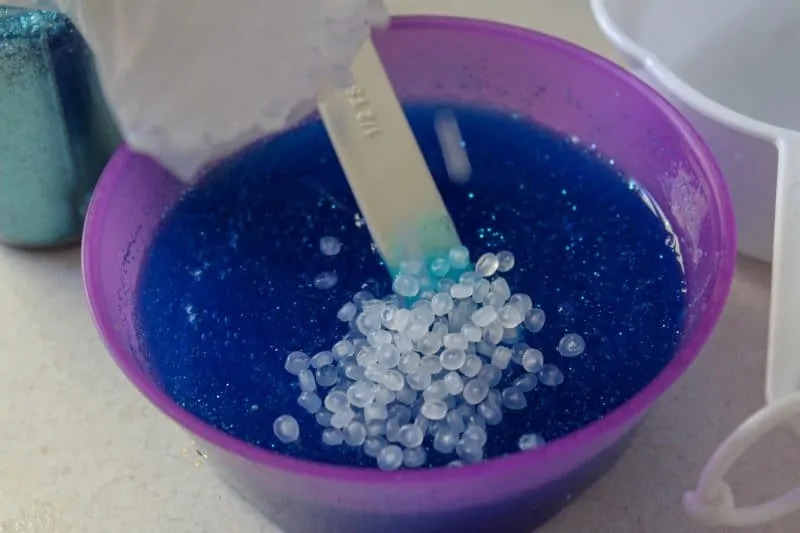 The fishbowl beads and soap colorant make it look just like the ocean! Why did I think making slime was complicated? I have all the ingredients and 4 little fingers who can help mix! 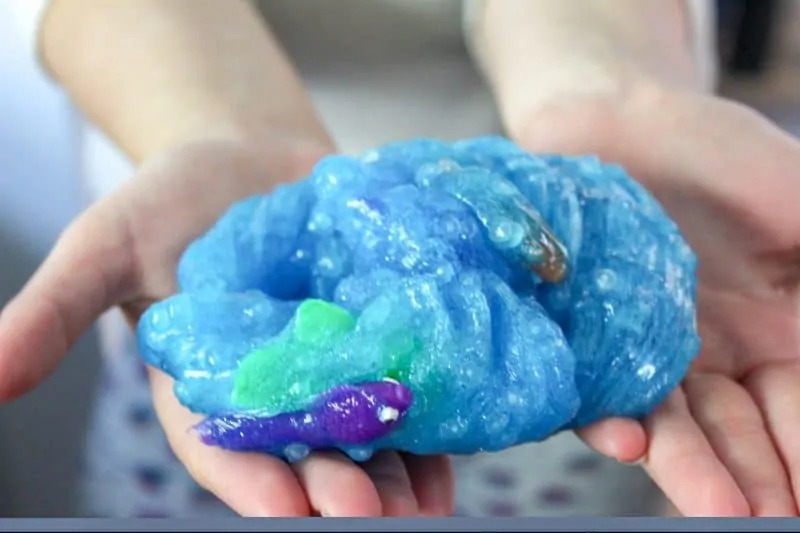 lol I’m going to be making slime with the kids this weekend! 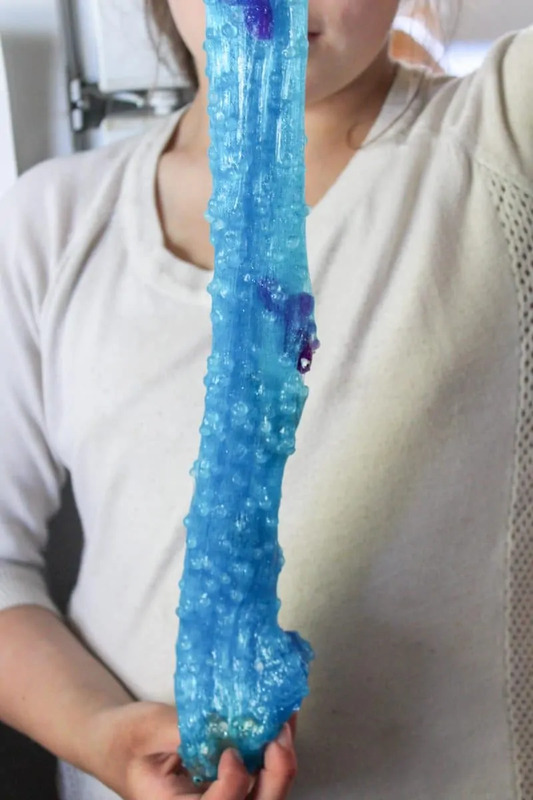 I prefer slime with the different textures – it makes it more fun!